Paul Drury was the son of the renowned sculptor, Alfred Drury. 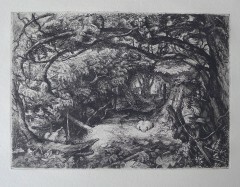 He attended Goldsmiths’ as an art student from 1921.Portraiture predominated in his early work yet his most famous prints from that time are the two or three small landscape etchings in the pastoral vein with which he and his colleagues, Graham Sutherland and Robin Tanner, became so closely associated. Paul Drury began etching in 1922 and continued until the end of his presidency of the Royal Society of Painter-Etchers and Engravers in 1975. 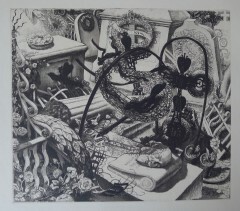 Although Drury exhibited regularly at the RA and the RE, he remained largely disinterested in self-promotion, particularly in the post-war period. Typically he would complete an image without editioning it and then move on to develop a new idea. 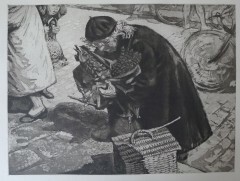 He produced over 90 prints during his life. 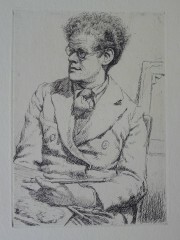 His early English Romantic etchings that he made in the 1920’s are highly sought after.